LA ROCHELLE, France, May 13, 2011 (ENS) – CityMobil is celebrating the outcome of five years spent developing and demonstrating innovative urban transport technologies with an international conference in La Rochelle that concludes today. 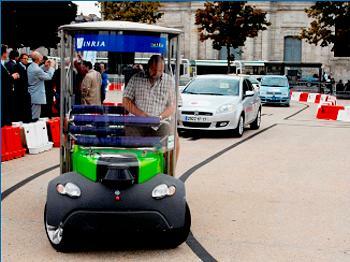 Participants are trying out the first-ever fully automated transport system operating in a mixed traffic public space. The on-demand automated service runs along a 1.6 kilometer route in La Rochelle, connecting several university locations, a media library and residential areas. There are three cybercars in the system; two are operating, while the third is recharging. One of the cars, called CyberGo, was specially designed for this type of shuttle operation. It has six to eight seats, is wheelchair accessible, and runs on batteries with a 100 kilometer (60 mile) range, considered sufficient for 12 hours of operation. The system has been running in La Rochelle since February. After evaluations from economic, energy, environmental, societal and technical perspectives, it could become the basis of a new role for the town, that of showcasing cybercar expertise. With a 40 million euro budget over five years co-funded by the EU’s Sixth Framework Programme for Research and Technology Development, Citymobil addressed the integration of automated transport systems in the urban environment. The program was based on creation of automated transport systems at three sites – London’s Heathrow Airport; the city of Castellón, Spain; and Rome’s new exhibition center. 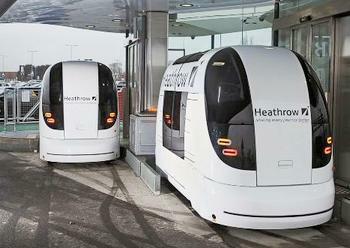 At Heathrow, after years of development, passenger trials of driverless, automated ULTra personal rapid transit, or PRT, vehicles began on April 18 and continued for three weeks. This summer, the first phase of the ULTra network – the first commercial PRT system anywhere in the world – will open at Heathrow. Twenty-one Ultra PRT vehicles will operate along four kilometers of guideway connecting two stations in the N3 Business Car Park with one station at Terminal 5. The ULTra PRT system was commissioned by BAA, formerly the British Airport Authority. At Castellón, CityMobil’s demonstration project is a hybrid transport system connecting two points within the city – the university and the city center – with the seaside resort town of Benicassim. Currently, only the connection between the university and the city center is fully operational. The system has two corridors totalling more than 40 kilometers (25 miles) with a specially built reserved platform for public transport vehicles. On this platform, electrical traction vehicles with guidance systems form a hybrid guided bus/tramway system. 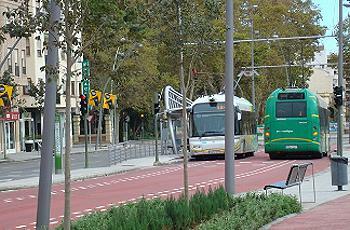 The guided vehicle systems take the steering away from the bus driver on the Castellón part of the route. The vehicles are powered by overhead power lines and have a secondary power supply system for the historical center of Castellón, where it is not possible to have an aerial power supply system. The goal in Castellón is to combine the cargo capacity, accessibility, speed and regularity of a railway with the flexibility, adaptability and lower cost of a roadway system. CityMobil’s Rome demonstration project is a Cybernetic Transport System. Still in the planning stages, the system envisions 20 automated driverless cybercars that will connect the main entrance of Rome’s new exhibition center with a 2,500 slot car park for visitors’ private vehicles. At the conference in La Rochelle, experiences designing, building, testing and implementing these systems will be explored. A session covering the opportunities and barriers to the introduction of automated transport is on the agenda. Participants will consider lessons learned from the CityMobil demonstrations, EU transport research priorities and funding for automated transport systems of the future.